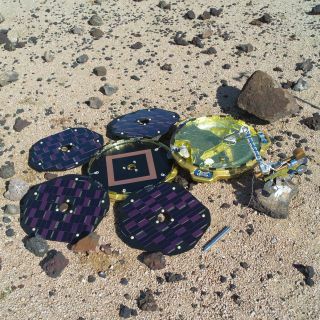 Has Europe's Long-Lost Beagle 2 Mars Lander Been Found? Model of the Beagle 2 lander on the Mars simulation surface at NASA's Johnson Space Center in Houston. The U.K. Space Agency is holding a news conference Friday (Jan. 16) about Europe's Beagle 2 Mars lander, prompting speculation that the probe has finally been found more than 11 years after dropping off scientists' radar during its journey to the Red Planet. The U.K.-led Beagle 2 was supposed to touch down on Dec. 25, 2003. The lander successfully deployed from the European Space Agency's (ESA) Mars Express orbiter on Dec. 19 of that year, but no touchdown confirmation came, and most experts think Beagle 2 crashed on the Red Planet's surface. The lineup at Friday's three-hour press event, which will be held in London, suggests that the long search for the lander or its remains may be over. The speakers include Beagle 2 Manager Mark Sims; U.K. Space Agency Chief Executive David Parker; Alvaro Giménez Cañete, ESA's director of science and robotic exploration; and John Bridges, a science team member on NASA's Curiosity rover and Mars Reconnaissance Orbiter (MRO) missions. Bridges works with MRO's HiRISE (High Resolution Imaging Science Experiment) camera, which takes supersharp pictures of the Martian surface. HiRISE has photographed the Curiosity and Opportunity rovers from space, and it also found NASA's twin Viking landers, which touched down on the Red Planet in 1976. The news conference will take place from 9:15 a.m. until 12:15 p.m. local time Friday at the Royal Society's Kohn Centre in London. It is unclear at the moment if the event will be webcast. Beagle 2 was part of the Mars Express mission, which launched in June 2003. The Mars Express orbiter, which served as Beagle 2's mothership, is still studying the Red Planet, more than 11 years after its arrival. The 3.3-foot-wide (1 meter) lander resembled a large pocket watch, whose outer casing was supposed to open upon the craft's landing on Mars. The solar-powered Beagle 2 was designed to study Red Planet geology, weather and climate, as well as search for possible signs of Martian life. The total cost of the Mars Express mission is 300 million euros (about US $350 million at current exchange rates), ESA officials say. Editor's note: The video in this story on Mars' appearance from orbit was provided by the European Space Agency under a Creative Commons agreement: ESA - European Space Agency, CC BY-SA 3.0 IGO.